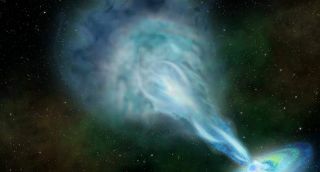 An artist’s illustration of a radio jet spewing out fast-moving material from the newly discovered quasar PSO J352.4034-15.3373, which lies about 13 billion light-years from Earth. Artwork by Robin Dienel, courtesy of Carnegie Institution for Science. Quasars are comprised of giant black holes gobbling up matter at the hearts of massive galaxies. Quasars emit huge amounts of radiation — so much, in fact, that they're the brightest objects in the cosmos. Most of this radiation is pretty high-energy; only 10 percent of quasars emit strongly in the radio range, the longest-wavelength portion of the electromagnetic spectrum. The newly discovered quasar, called PSO J352.4034-15.3373, is one of those radio blasters, and it lies nearly 13 billion light-years from Earth — meaning its emissions have zoomed through space for about 13 billion years before reaching our planet. PSO J352.4034-15.3373 therefore provides a look at the early days of the universe, which came into being with the Big Bang 13.82 billion years ago. "There is a dearth of known strong radio emitters from the universe's youth, and this is the brightest radio quasar at that epoch by an order of magnitude," Eduardo Bañados, of the Carnegie Institution for Science in Washington, D.C., said in a statement. Bañados led the team that found PSO J352.4034-15.3373. That initial discovery was followed up by Emmanuel Momjian of the National Radio Astronomy Observatory, whose observations allowed astronomers to characterize the quasar — and to spot jets of superfast plasma spewing from the exotic object. These jets, whose material moves at nearly the speed of light, could help astronomers better understand the long-ago era when the universe's first stars formed and began clumping together, researchers said. "The jet from this quasar could serve as an important calibration tool to help future projects penetrate the dark ages and perhaps reveal how the earliest galaxies came into being," Bañados said in the statement. The discovery is detailed in two papers published online today (July 9) in The Astrophysical Journal. Editor's note: The original version of this story incorrectly stated that quasars emit mostly in the radio range of the electromagnetic spectrum. In fact, just 10 percent of known quasars are strong radio emitters. Email Chelsea Gohd at cgohd@space.comor follow her @chelsea_gohd. Follow us @Spacedotcom, Facebookand Google+. Original article on Space.com.